Home About Kelsey L. Hazzard Esq. Kelsey L. Hazzard, Esq. 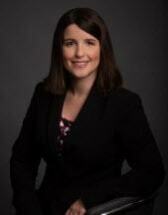 is the lead litigation attorney for Adamczyk Law Firm, PLLC, which she joined in November 2017. She has primary responsibility for the firm's litigation and dispute matters, including construction defect claims, lien foreclosures, and complex commercial litigation. Kelsey grew up in Naples, Florida. She is a proud graduate of the University of Miami (B.A. 2009) and the University of Virginia School of Law (J.D. 2012). Immediately following law school, she devoted a year to public service as the 2012-2013 legal fellow for Americans United for Life in Washington, D.C. When her fellowship concluded, she returned home and began her career as a litigator. Kelsey strongly values community involvement. She serves as president-elect of the Michael R.N. McDonnell (Collier County) chapter of the American Inns of Court, scholarship chair of the Naples Junior Woman's Club, and vice president of the University of Miami alumni association's southwest Florida chapter. In her free time, you'll find her singing karaoke or enjoying a nature walk.